As we write this, the finale of the Cornetto Trilogy is entering its final stages. The World’s End is the third (well, third and a half if you count ‘Paul’) movie in the unofficial trilogy of genre fiction/comedy/blisteringly funny, smart and frequently touching dissections of the male geek psyche trilogy that Edgar Wright and Simon Pegg started with Shaun of the Dead. The first two movies, Shaun and Hot Fuzz, are fiercely smart love letters to and parodies of zombie movies and cop movies respectively and The World’s End is…well…here’s the thing. We don’t know. There’ve been conflicting reports ranging from zombies and a musical number to Simon Pegg claiming the movie isn’t actually about the end of the world at all. What we do know is that, decades after they first attempted it at college, a group of friends try and complete an epic pub crawl as…something, begins to happen out in the world. We know Wright is directing, know Simon Pegg and Nick Frost are front and center and we know that this time they’re being joined by a supporting cast including Martin Freeman, Eddie Marsan, Paddy Considine and David Bailey, who I fervently hope, is making his peace with spending the next few years being asked if he’s going to be playing William Hartnell playing the 1st Doctor again soon. We also know it will involve a flavor of Cornetto ice cream, because, in each of the previous movies, the ice cream has appeared. All the signs point to The World’s End being a perfect capstone to two of the smartest, most interesting geek culture movies of the last twenty years. In 2002, riding high on the success of Spaced, Wright and Pegg went to LA to meet with the studios. They had a script ready, a self styled ‘zomromcom’ about a feckless young Englishman who finds himself forced to step up again and again as the cosy world he’s built himself is literally eaten away by the zombie apocalypse. The buzz on the script was huge, Spaced had closed out as a vast critical success and its cult status was achieved and the whole movie could be filmed, in London, for a modest budget. The pressure on the two was almost indescrible; they were, at this stage, two UK comedy writers without a tremendous amount of work behind them and they’d been handed the brass ring; a shot at Hollywood. To turn this down would spell career suicide but to compromise the script’s inherent Britishness could mean the exact same thing. In interview years later, Wright admitted they’d kicked around rewriting it for a female lead and calling it Dawn of the Dead, but it had never gone anywhere and, for a while, it seemed Wright and Pegg would do the same. Until they came up with an idea; they were untried, untested as big screen scriptwriters. So why not take the initial script out of their hands altogether? The plan they presented was simple; give us carte blanche access to everything you have in devel0pment hell, we’ll pick a script, pitch it and if you like it, then that’s what we’ll push ahead on. Then, if it’s successful, Shaun would be next on the list. 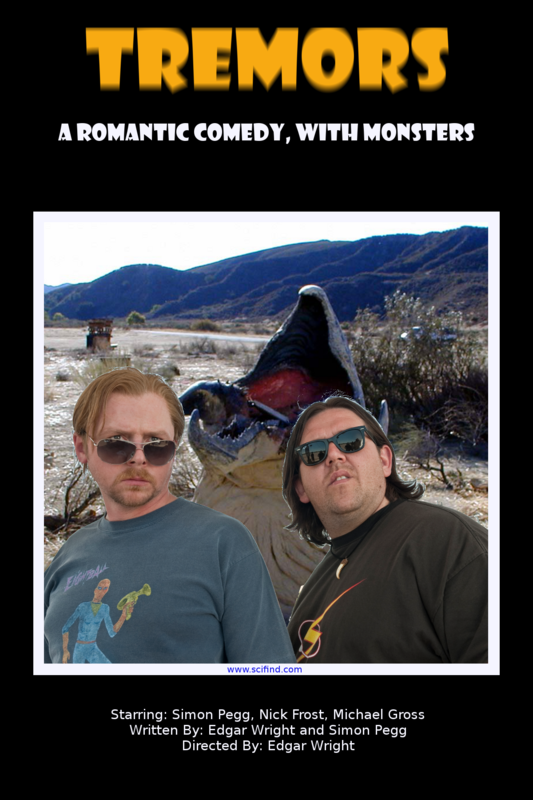 Universal agreed, and Wright and Pegg picked an undeveloped script from 1987 by SHORT CIRCUIT writers S.S. Wilson and Brent Maddock entitled “Tremors”. 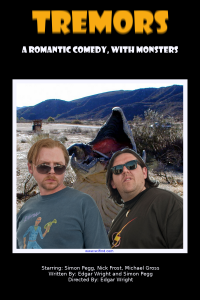 Tremors is set in the Desert town of Perfection Valley and follows the misfortunes of two British ex pats with one time big ideas trying to make their way in the world. Valentine (Val) McKee (Simon Pegg) came to the US on a gap year and never went back. His work as a handy man in Perfection Valley means he knows, and is liked by, very nearly everyone but also means he has no reason to move on. The fact he lives, and works, with best mate Earl Bassett, also an ex pat and handyman but more the ‘logistical side of things’ (And Perfection’s one and only drug dealer) doesn’t help either. The pair live on the outskirts of town, have all the beer, money and food they know what to do with and can drink for free at Chang’s as long as they unblock the toilets regularly. Life is good. Earl: Can I get… any of you cunts… a drink? Val: Is it still out there? Earl: Yeah. What you think we should do? Val: Have a sit down? Finally realizing they have to do something they start pelting the beast with cans of beer. What follows proved to be another fan favorite sequence, starting with Val saving the town pogo record holder (Played by young Ariana Richards) from a Graboid, taking in Val and Rhonda’s (sort of) reconciliation, the revelation that the bookish, polite Rhonda can out swear Earl and Val, Rhonda, Earl, Chang and the other townsfolk killing a Graboid with pickaxes to the tune of the Queen song “Don’t Stop Me Now” on the Jukebox in Chang’s before they retreated to the roof. They recuperate and Burt assures them the Graboids can’t get in right before one smashes the wall of his gun vault because Earl couldn’t be bothered to close the gate behind them. Everyone bar Burt, his wife, Val, Rhonda and Earl are killed and Val finally loses it at his oldest friend, screaming at him about how unreliable he is. The survivors realize they need to get out of the valley to get help. The only way to do this is by riding the tractor out across eight klicks of pure sand, but, as Rhonda notes that on the way they’ll pass the geological survey station she was working at and can use the charges she has left to defend themselves. The survivors gear up, in a scene which riffs on the arming up scene in Predator (And would later itself be riffed on in Slither), and they head out. VAL: I don’t think I have it in me to lose my job, my house, my best friend and ask the local gun nut to kill my girlfriend and I in the same day. RHONDA: Who says I’m your girlfriend? Val’s had enough. He kisses her, grabs the charges and sprints out towards the cliff, yelling and screaming. The others watch, horror struck as the Graboids all turn and head straight for Val. Standing at the very edge of the cliff, he lights and throws all the carges behind the Graboids, the sound and vibration enraging them and driving them even faster towards him. Val, clearly terrified, holds his ground and at the last possible second leaps aside as the Graboids smash through the cliff beneath him and…sail into thin air and crash to the ground hundreds of feet below, dying instantly. EARL (LOOKING AT EVERYONE’S AMAZEMENT): ….What? Embracing his friend, Val asks how he’s alive and Earl explains he threw everything out of his pockets as he ran off, including his stash. Which the Graboid ate. And which appears to have calmed it down. The screen fades out on him talking to Burt about tourists coming to Perfection, and Val and Rhonda kissing. The movie opened modestly, was critically acclaimed in the genre press for the unusual step of being a monster movie set almost entirely during the day and continues to enjoy a long life on DVD and On Demand services. No less than three sequels and a short-lived TV show were produced, none of which involved Wright, Pegg and Frost in any way. This wasn’t out of any sense of falling out, after all the studio were extremely pleased with the results, but rather a sense of them having ‘graduated’. Interestingly though, the franchise would remain a regular stopping off point for English screen writers cutting their teeth in Hollywood, with both Harold Overman and Toby Whithouse writing sequels. Also, the Spaced connection remained a close one, with Jessica Hyne starring as a colleague of Rhonda’s in the sequel and Michael Smiley appearing as both the new head of the Game Reserve in Tremors III and the TV show and his own, great grandfather in the hugely entertaining Steampunk prequel, Tremors IV. That movie was directed by Greg Mottola, who would go on to work with Pegg and Frost on Paul. Val: [about Earl] He’s not my boyfriend! Earl: [handing beer to Val] It might be a bit warm, the cooler’s off. This was also answered by Wright turning the right wing criticisms of the movie into a marketing tool, arranging for a two day film festival at the Alamo Drafthouse, alternating movies dealing with homosexuality and buddy action movies. The festival is still running today, and Wright is viewed as a friend of both the cinema and the city. -Wright parlayed his success into not only Shaun of the Dead but a permanent ‘talent exchange’ arrangement with the US. This led to him essentially splitting his career between the US and the UK, culminating in the confirmation of his Ant-Man movie at ComicCon in 2012. Rumours persist that Wright is front runner to take over control of the Marvel Movie universe when Joss Whedon steps away but those have yet to be confirmed. The possibility of him directing an episode of Doctor Who however, refuses to go away and Wright seems likely to go behind the camera there for Season 8 in 2014. – Pegg, despite the doubts of some elements of British fandom, became a movie star in his own right in the US, appearing in the Mission:Impossible and Star Trek reboot series. He also narrowly missed out on a stint on Doctor Who, and, at time of writing, is one of the last few actors in contention for the lead role in Doctor Strange. -Frost also made it big in the wake of Tremors, not only through working with Wright and Pegg but as a regular fixture on US TV. His laconic, deadpan approach on screen and his fierce love of cooking off made him a personality in his own right leading to him being invited to appear on shows as diverse as Man Vs Food, Dancing With The Stars and The Daily Show. an abandoned 1980s action comedy called Police Academy. It seems that the American blue Cornetto is finally on the way. Even better, Wright and Pegg have confirmed this is the long-rumored crossover movie. Sergeant Nicholas Angel is going to America. And he’s bringing his ice cream with him.